The American Psychiatric Nurses Association (APNA) announces the 2016 class of the APNA Board of Directors Student Scholars. This scholarship recognizes undergraduate/pre-licensure students and graduate students whose accomplishments exemplify their dedication to psychiatric-mental health nursing. The Board of Directors Student Scholars are truly inspirational in their noticeable leadership so early in their careers. This year, the American Psychiatric Nurses Association has selected 30 undergraduate/pre-licensure and graduate students to receive the APNA Board of Directors Student Scholarship. 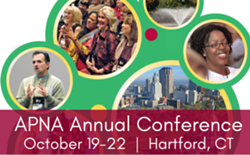 These students will receive complimentary registration, travel, and lodging expenses to attend the APNA 30th Annual Conference, October 19-22, at the Connecticut Convention Center in Hartford, Connecticut. This conference will offer the scholarship recipients 4 days of networking opportunities with psychiatric-mental health nurses, mentoring events, and educational sessions on a variety of topics presented by content experts in the field. Additionally, these students will receive one year of complimentary membership in APNA, which will allow them to interact with experienced nurses and experts in psychiatric-mental health nursing. They will also have access to education and resources to further develop their skills as they prepare to practice nursing. Prelicensure/undergraduate recipients of the 2016 APNA Board of Directors Student Scholarship are: Nazokat Atadjanova, Medical University of South Carolina; Amanda Baecker, Nell Hodgson Woodruff School of Nursing at Emory University; Joseph Beeman, University of Pennsylvania School of Nursing; Maila Bezerra York, University of North Carolina Wilmington School of Nursing; Nicole Boydston, Samuel Merritt University, San Francisco Peninsula Campus; Jeremy DiBiasio, Rhode Island College; Rachel Hendron, University of Iowa; Brayden Kameg, University of Pittsburgh School of Nursing; Hannah Long, Purdue University; Cecilia Lopez, University of Texas; Megan Mehicic, Kent State University, Geauga Campus; Leslie Miller, Decker School of Nursing Binghamton University; Emily Rude, University of Virginia School of Nursing; Cole Upton, University of Cincinnati College of Nursing; Eleanor Walsh, University of South Carolina College of Nursing. Graduate recipients of the 2016 APNA Board of Directors Student Scholarship are Lindsay Anderson, University of Minnesota, Twin Cities; Jeanette Avery, East Carolina University College of Nursing; Bailie Cronin, The University of Colorado Anschutz Medical Campus School of Nursing; Dallas Ducar, University of Virginia School of Nursing; Kathy Hunter, Wayne State University; Manton Hurd, University of California, San Francisco; Deborah Johnson, University of Arizona; Sooksai Kaewbua, University of Kentucky, College of Nursing; Jenna Levenson, Johns Hopkins University School of Nursing; Jentina Mitchell, MGH Institute of Health Professions; Valerie Rice, Vanderbilt University; Aaron Salinas, University of Texas Rio Grande Valley; Alenna Smith, The Ohio State University; Ann Stanton, University of Wisconsin-Milwaukee, College of Nursing; Douglas Taylor, Uniformed Services University of the Health Sciences.